It's all pretty straightforward except for one aspect of the RECIPIENTS section. Can I send a screenshot? If not, my questions is: for Recipient Email, the only options I see on the dropdown are "Please Select" and "Select Workshop Attended"
The recipients list is dependent on the actual fields compatible with the recipients settings on your autoresponder email, which your form has. On the screenshot above, I have on my form the Full name field, and two email address fields. So on the recipients dropdown list, it picks up the compatible fields which are the two email address fields from my form. So I can only choose either of the two as my target recipients when the form gets submitted. In any case, you can reply here on this thread to upload your screenshot. OK - I think I'm understanding a little more about this. Here's my structure. I have a form that lists all the workshops that are available at the conference. On this form, attendees will see a list of all the workshops they have attended each with its own checkbox. This main form also has the attendee's contact info, name, email, phone, etc. With each title they check, the relevant evaluation form associated with the workshop title selected then becomes unhidden for the attendee to complete. Once complete, the attendee will digitally sign (somehow) and receive for that workshop a PDF certificate of completion pre-signed by our Programs Director, which they can then download and print, and write in their own name. So our evaluation form itself doesn't have an email address. It seems that from your response, that an email address not only needs to be on the main workshop list form, but also on the evaluation form. Do I have that correct? If this IS the case, is there a more efficient way for me to set this up for attendees to choose their evaluation forms so that the auto-responder that is connected to an email address in that form will work? Hope that's clear...! Yes, in order for an autoresponder to work, it requires an email address primarily. Otherwise, the email can't be sent to someone if there is no target recipient. I also realized you are mentioning of a main form and evaluation forms. 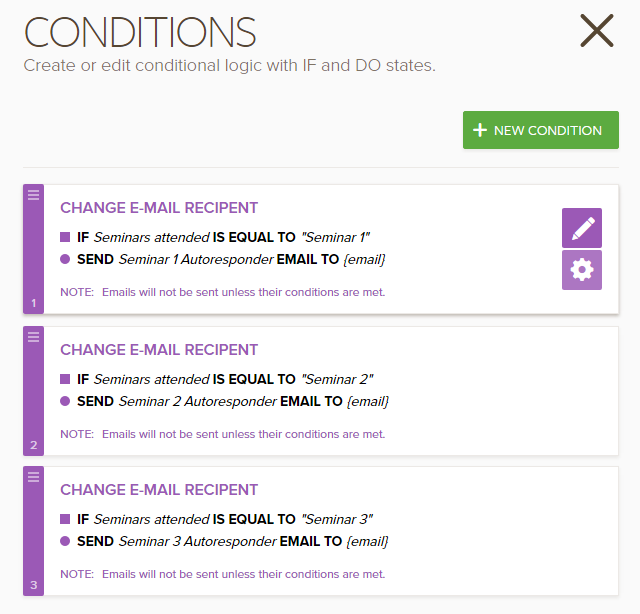 For now, it is unclear how you pass the information from the main form and how the user proceeds to the evaluation form. I'm thinking of a viable solution. But for us to be able to better understand your concern, it would be better if you can give us a walk-through of the actual process flow and the forms in issue so that we can formulate a solution on how to make it work. OK - Thanks - I'll try to be more clear. Maybe we can condense all into one form instead of two as I described above. Attendees need to be able to select any number of workshops that they attended so that they can complete evaluation forms for each, in order to receive their PDF Certificate of Completion. That's the goal. I do likewise think that it can be better to be under one form. There is also an option on how to select specific values such as using a checkbox field, and then create a number of autorsponder email alerts. 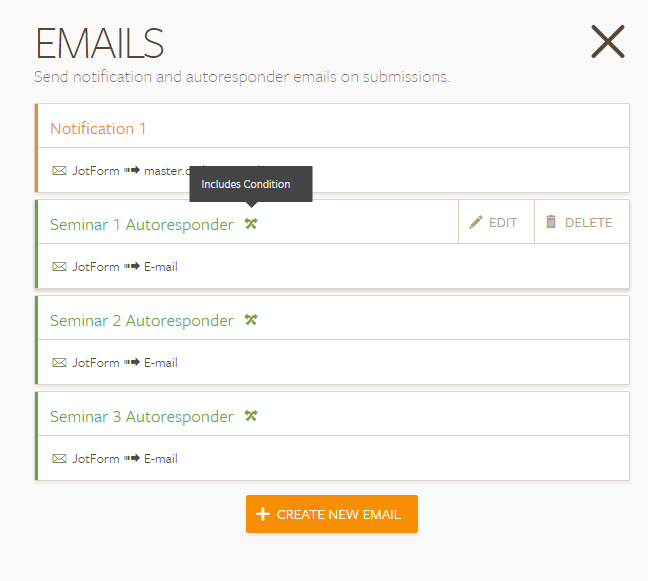 And set the autoresponders to only submit to a specific form once a certain condition is met. 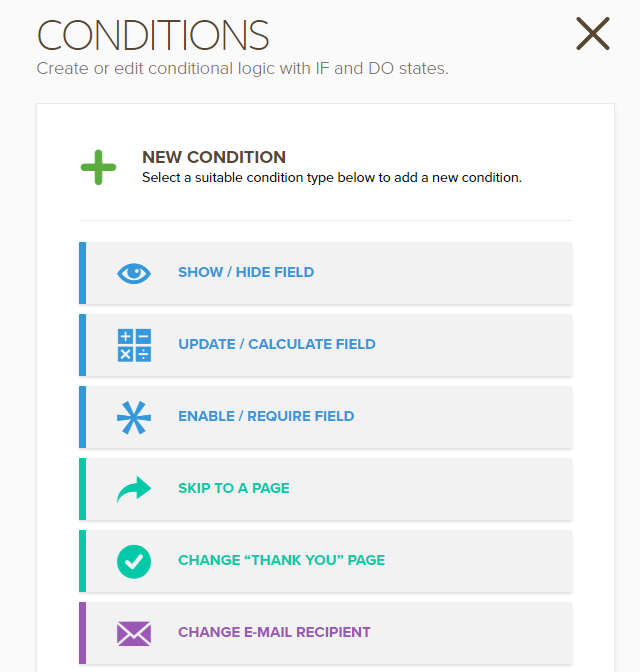 Note: You can further enhance your form to use conditions for showing or hiding fields depending on selections in the form, etc. So I have a similar page, that I had started before I talked about the page with straightforward text links. I will see if I can understand how to apply the conditions. I'm assuming that I still need to have email address on the evaluation form? Here's the link to my checkbox form which is similar to yours. When I'm looking at the condition statements I see "show/hide field" not "change email recipient". Sorry - still confusing! The condition that you have is a show/hide condition. Please take note that for a kind of action that you wish to use, you will need to use a different option. 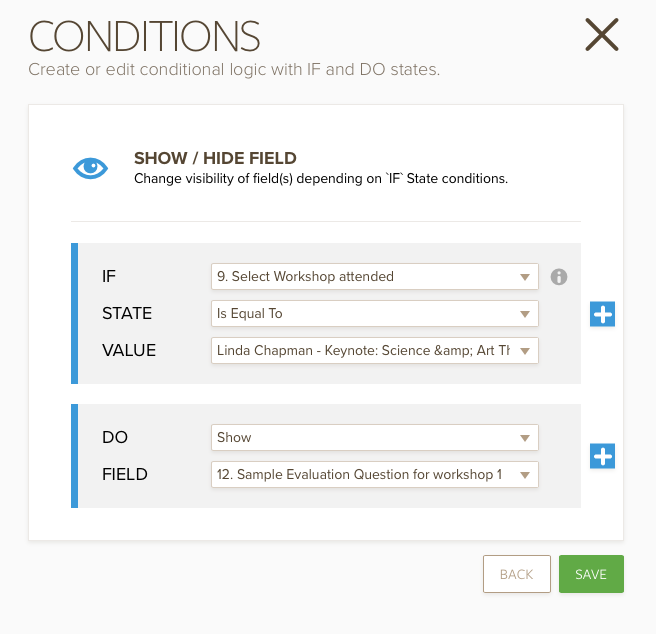 Notice that on top is the one you used, the Show/Hide Field condition. The one I used is at the bottom, the Change e-mail recipient condition. Yes - I found the full list of conditions. Thank you. Can you send me a URL for a form that when a workshop is selected, the user will be directed to the correct evaluation form. I am sorry, I still see a disconnect. There is an aha moment in here somewhere, but I'm not there yet! I hope I'm getting closer.. 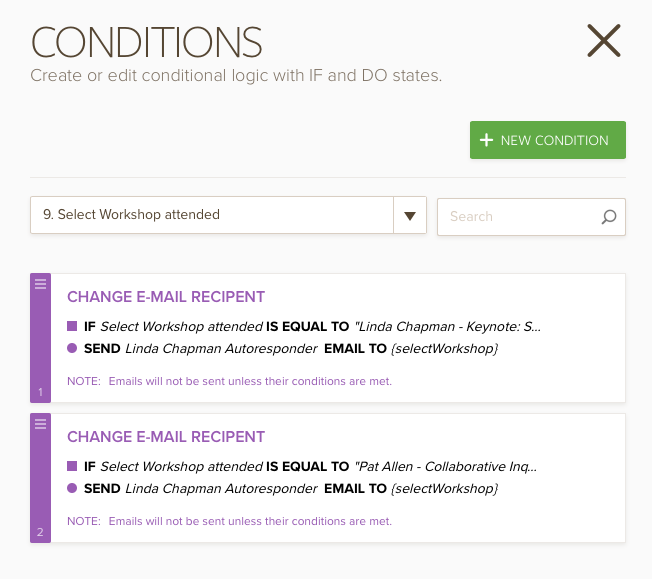 Here's a screenshot, but no EMAIL TO option is available, only (selectWorkshop).